We’ve been playing around a lot with our chocolate ice creams over the last months, and here’s a flavour that has gone down a storm in the shops. Instead of using melted chocolate (such as in our chocolate whiskey recipe), as we have always done, we’ve used pure, 100% cocoa powder. The benefit of this is that you’re introducing less fat into the ice cream, and so it has a much more intense chocolate flavour. If you want, you can add chocolate chips for even more chocolate hit. • 75 g dark chocolate chips, optional. 1. Combine the cocoa and sugar and stir until combined. 2. Add the egg yolks and beat until thick. 3. Bring the milk to a low simmer. 4. Beat the milk into the egg/sugar/cocoa in a slow stream. 5. Pour the mixture back into the pan and place over low heat. 6. Stir continuously until the custard thickens slightly (around 65-70C) and just coats the back of a spoon. Don’t over-heat, though, because at around 76C you will scramble the eggs! 7. Immediately remove from the heat. 8. Allow to cool, then stir in the vanilla. 9. Whip the cream until it has doubled in volume (you should have soft peaks – don’t over-whip). 10. Fold (gently stir) in the custard. 11. 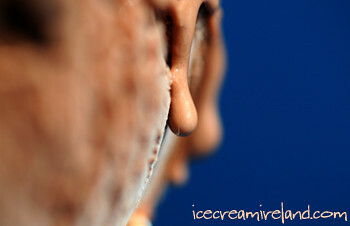 Freeze using a domestic ice cream machine, or cover and place in the freezer, adding the chocolate chips when it is somewhat solid. 12. If you’re using a domestic ice cream machine, transfer to a freezer-proof covered container when the ice cream has achieved a semi-solid consistency (around 15 minutes). Place it in the freezer, and continue to freeze until it is solid. 1. Make sure your cocoa is of a good quality and is fresh. Cocoa can go stale very quickly once it is opened. 2. In case you’re wondering, we’re using Chocolaterie de l’Opera cocoa at the moment, which has a lovely taste and an amazing reddish colour. 3. To pasteurise the eggs, heat the custard to 73C and maintain that temperature for at least 5 minutes. Use a cooking thermometer, though, and keep stirring! If the custard goes any higher than 76C, the eggs will scramble. Immediately cover and place in the freezer until cool. I like chocolates and all chocolates related recipes. So very thanks for this. I hope you brings more recipes in future. Great recipe! Do you use a particular brand of cocoa? It’s hard to find a good one. My favourite cocoas are made by Valrhona and Chocolataire De L’Opera. I don’t know if you can find them, but if not, just make sure it’s good quality, fresh, 100% cocoa. I have just made this and it’s great. 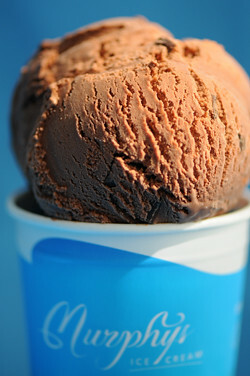 I love how deep the chocolate flavour is with just cocoa. I didn’t add the chocolate chips, because I always find that they don’t have much flavour when they’re frozen…not that I’d object to chocolate chip ice cream in general though! I’ve made this along with my own coffee-cointreau ice cream (with the same sort of ice cream base) which is another lovely flavour. I think that it’s nice to make a flavour that’s slightly unusual, something you can’t buy from the frozen section of the supermarket. Thanks, once again, for all the brilliant recipes and also the ready-made ice cream for when I’m not bothered making my own or when I just need a pick-me-up in town! I’m delighted the recipe turned out well! Thanks for commenting. Looks delicious! 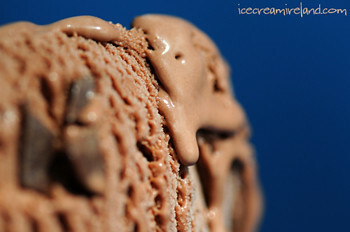 I love dark chocolate ice cream. It is one of my biggest weaknesses.